How much does it cost to travel to Budva? How much money will you need in Budva? €49 ($56) is the average daily price for traveling in Budva. The average price of food for one day is €10 ($11). The average price of a hotel for a couple is €45 ($51). Additional pricing is in the table below. These average travel prices have been collected from other travelers to help you plan your own travel budget. How much money do I need for Budva? 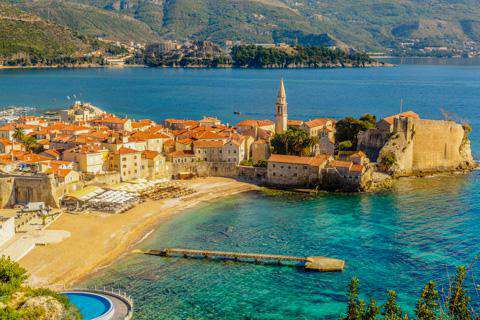 A coastal resort in Montenegro, Budva is probably the country&apos;s most popular tourist destination. Not only does it host a number of great beaches, but it is also home to a picturesque old town center located on a small peninsula. Some of its best features include narrow winding lanes, historic buildings, churches, and small squares. Mostly known as a vacation resort, Budva&apos;s Mediterranean climate draws visitors to its beaches. There are many, mostly rocky beaches with some sand, but the most visited are Slovenska Plaza and Mogren Beach. Slovenska is the largest and most popular beach, often compared to Miami. It is soft and sandy, has a sidewalk nearby with cafes, bars, restaurants, and vendors selling cold drinks and snacks-but it does get very crowded, so arrive early to pick your spot for the day. Mogren is one of the more beautiful, natural beaches, which can be reached by a pedestrian boardwalk from old town. It has two beaches connected by a small tunnel, and surrounded by tall cliffs and greenery. The town itself also has a few sights worth seeing. One of the most popular is a medieval fortress ruin known as the Citadel. From the Citadel&apos;s terrace are some of the best views of Budva. Other nearby points of interest include the historic Holy Trinity Church, Church of Saint Ivan, and the Church of Saint John, all of which have some combination of unique medieval architecture, icons, and artwork. For more history, visitors can also see archaeological findings at the Museum of the Town of Budva. Budva is located on the central part of the Montenegrin coast, known as the Budva Riviera. It developed around the peninsula where the old town is situated, also known as Stari Grad. This part of town actually began as a sandbar island and was eventually turned into a peninsula over the years. Surrounded by ancient Venetian walls, the old town was once a medieval fortification. There are five entrance gates, with the town behind the walls full of narrow streets, terracotta roofs, cobblestone paths, churches, monasteries, and opportunities for shopping and dining. Besides the old town, the main center of activity is the promenade along the coast where there are many bars and nightclubs as well as access to the water. Many visitors come to relax by day on one of Budva&apos;s Mediterranean beaches, and party by night at the many bars and nightclubs. There is also something to be said for exploring Budva&apos;s charming old town and learning a little bit about its ancient and medieval history. Once you have experienced the culture of old town, diving and water sports such as kayaking, scuba, waterskiing, jet skiing are popular activities along the coast. For a unique day on the water head to Ulcinj (65 kilometers south of Budva), where one dive will take you along portions of a sunken ancient Roman city and shipwrecks from the 1700s. Because of its proximity to the sea, Montenegro has plenty of fresh fish and seafood dishes with fresh catches like prawns, mussels, clams, shrimp, and octopus. These dishes are typically garnished with polenta, blitva (a kind of spinach), or broiled potatoes. Drying fish is also traditionally practiced along the coast. Another specialty of Montenegrin cuisine is a variety of soups: &apos;supa&apos; for clear soup, &apos;?orba&apos; for a thick soup or stew, and &apos;kaa&apos; for a porridge-style dish. For dessert, there is an assortment of local sweets, including pala?inke (a large pancake filled with jam, chocolate or cream), baklava with raisins and walnuts, krofne (doughnut filled with jam or chocolate), and a cream layered cake called krempita. Most sweets are served with coffee. Budva has a wide variety of places to eat from seafood and national cuisine like the dishes mentioned above to western food like pizza, barbeque, and other fast food. Dining options can be found just about anywhere, especially in the downtown, old town, and Slovenska Plaza. By plane, Podgorica Airport is Montenegro’s main international airport, located about 65 kilometers from Budva, serving as a hub for Montenegro Airlines. Tivat Airport is closer to Budva, about 20 kilometers away from town. It has regular flights to Belgrade and Moscow throughout the year, and charter flights to major European destinations during the summer. Another possible flight option is Dubrovnik Airport in Croatia, about 80 kilometers away from Budva. It is served by many major airlines, making it a good option for tourists coming by plane. By bus, Budva is well-connected to other Montenegrin cities as well as major cities in neighboring countries. Budva can also be reached by car using the coastal road.